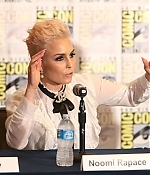 elcome to Noomi Rapace Online. A fan site dedicated to the swedish actress Noomi Rapace, celebrated for her performances on the big screen. She's best know for her roles in swedish version of "The Girl With The Dragon Tattoo", Alien's prequel Prometheus, Netflix's What Happened to Monday and many more. Our goal is bring you with latest up-to-date info, photos and media on her. Please bookmark us and return for your daily Noomi fix.